Your health isn't just determined by what goes IN your body, but, also but what goes ON your body, as well. 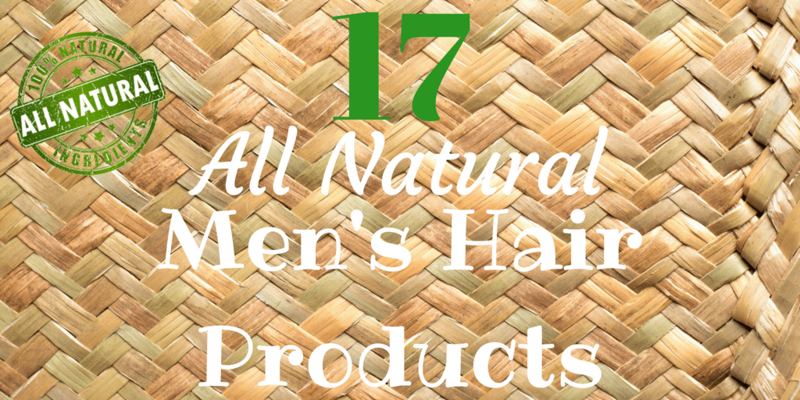 Read on for my review of the Best Natural Men's Hair Products! It isn't as easy for men to find good natural or organic hair products as it is for women, but it is just as important that we use them. Just why is it important to use natural hair products? Your hair is very porous and absorbs pretty much anything you put on it. If you want healthy looking hair, and who doesn't, then you need to use natural men's hair products that don't have synthetics and are harsh chemical free. Just as the clothes make the man, the way you present your hair grooming says a lot about you. Using nutrient rich hair products leaves your hair healthier than if you didn't use any hair products at all. That gives your hair a natural looking appearance and says that you care about your overall health. If you're not super concerned about using only natural products, you should check out my overall review of the best shampoos and conditioners too. There's nothing more attractive than a guy that shows that he cares about his health. Having natural looking and healthy hair and skin does a lot to convey that to people. I have compiled a list of some of the best natural and organic men's hair products, but even if you don't take any of the recommendations, then there are a few things to keep in mind for your search. Always look for hair products that are phthalate free, sulfate free, non synthetic and harsh chemical free. To cut to the chase, my top pomade pick is the Mr. Pompadour All Natural Peppermint Beeswax Pomade. It has a great medium hold, it smells good, and it comes out easily. For shampoos and conditioners, I like the Maple Holistics Argan Oil Shampoo and the Silk18 Argan Oil Conditioner respectively. In addition to natural hair products there are other natural grooming products, like organic self tanning lotions and natural deodorants. Natural hair care is the best thing you can do for your hair. Take it from a bald man, don't take your hair for granted! Some of the hair products on this list might not be 100% natural or 100% organic, (though some are) but none of these natural hair products contain any harsh chemicals and use primarily natural ingredients. All of them will nourish your hair more than the typical hair products. Aqua, Argan Oil, Botanical Keratin, Peach Kernel Oil, Almond Oil, Jojoba Oil, Camellia Seed Oil, Natural Vanilla, Honey Fragrance, Avocado Oil. Maple Holistics claims that no other shampoo contains as many beneficial ingredients as this Argan oil based shampoo. Argan oil moisturizes your hair and leaves it soft and natural looking. Almond oil repairs dry or irritated scalp. Camellia seed oil provides some anti-oxidents to your hair and botanical keratin strengthens your hair naturally. If you see your hair in the shower drain, then the properties of this all natural shampoo will restore your hair and slow the hair loss. Not male pattern baldness, however, but hair loss caused by other factors, such as clogged pores, damaged scalp or over colored hair. Most natural shampoos don't lather up well, but Maple Holistics has figured out a formula that gives you a nice lather. Though, a sudsy lather doesn't mean your hair is any cleaner than a formula that doesn't lather up as well. But, a good sudsy lather does feel nice so extra points for that, anyway! If you have the occasional dandruff, this will get rid of it and leave your scalp itch free. Downside to this is that it is fragrance free, but to some that is a positive. Many people like the aroma therapy aspect of a great smelling natural shampoo, however. Many people consider this the best argan oil based shampoo out there. Naturally Balances Oils in Hair and Scalp. Aqua, Sodium Cocoyl Isethionate, Cocamidopropyl Betaine, Sodium Lauroamphoacetate, Sodium Methyl Cocoyl Taurate, Sodium Lauryl Glucoside Carboxylate, Lauryl Glucoside, Sodium Cocoyl Glutamate, Acrylates Copolymer, Coco-Glucoside, Glyceryl Oleate, Caprylhydroxamic Acid, Glyceryl Caprylate, Glycerin, Sodium PCA, D-Panthenol, Simmondia chinensis (Jojoba) Oil, Botanical Keratin, Citrus limonum (Lemon) Oil, Callitris intratropica (Cypress) Oil, Prunus persica (Peach Kernel) Oil, Rosmarinus officinalis (Rosemary) Oil, Ocimum basilicum L. (Basil) Oil. If you have oily or greasy hair and scalp I am sure you have had some run ins with non natural shampoos that strip your hair completely and leave it dry and brittle with a harsh chemical smell afterwards. If you haven't found the right all natural shampoo just yet, then you need to turn your attention to this Degrease Moisture Control Shampoo. As the name suggests, it is formulated especially for oily hair and scalp. It's sulfate free and safe for color treated hair. It has a hypoallergenic formula that is also paraben free, BPA free, phtalate free, contains no artificial fragrances, colors or dyes, and contains no harsh or harmful chemicals. It's your sebaceous glands that are producing too much oil that is causing your oily hair problem. Most shampoos for oily hair just strip your hair of it's moisture leaving it dry and brittle. This shampoo goes after the glands so there isn't as much oil to begin with, then gently cleanses your hair so it still leaves it hydrated. The natural extracts and oils work as a therapy for your hair and scalp. It helps increase circulation of the scalp eradicating any irritation, it strengthens your hair with botanical keratin and deters flaky skin caused by an overly oily scalp. It has a pleasant herbal scent and leaves the hair feeling natural and you can go several days without washing and your hair still won't look greasy. Water, sodium cocoyl gender-based, aloe extract, glycerin, radish root ferment filtrate, sodium stearoyl lactylate, lauric acid glycerides, coconut alkanes, cocoa bitterness, Damascus rose water, olive oil, sweet almond oil , hydrolyzed wheat protein, white willow bark extract, rose geranium oil, comfrey extract, shea butter, argan oil, the European Acacia seed extract, witch hazel water, cetyl alcohol, jojoba oil, glycerin stearin esters, xanthan gum, vitamin b12 tea tree oil, coconut oil, argan oil. A great natural shampoo should first and foremost leave your hair much healthier over time than if you used a synthetic shampoo. Keeva Organics is one that if you use it for a while will see amazing results. Your hair will be hydrated, and if you suffered from dry or irritated scalp, your scalp will thank you. As with all natural shampoos, there are no parabens or sulfates and, as an added bonus if you care about animals, they do not test on animals. If you get your hair colored or use a hair dryer to style your hair, then your hair is getting damaged. You can restore it by using Keeva Organics as the essential oils from argan, coconut and tea tree will repair the damage. Don't expect a great sudsy lather, however as it won't achieve that. Sudsy lather is not an indication that it works. It just feels good to get that lather going! But, trust me when I tell you that it works even though you might be disappointed in the lack of suds. And you will notice the difference as soon as you use it as you will feel how soft your hair is after. The only downside to this organic shampoo is some guys think the scent is a little girly. But it isn't an overpowering scent anyway. Aqua, Sodium Cocoyl Isethionate, Cocamidopropyl Betaine, Sodium Lauroamphoacetate, Sodium Methyl Cocoyl Taurate, Sodium Lauryl Glucoside Carboxylate, Lauryl Glucoside, Sodium Cocoyl Glutamate, Acrylates Copolymer, Coco-Glucoside, Glyceryl Oleate, Caprylhydroxamic Acid, Glyceryl Caprylate, Glycerin, Sodium PCA, D-Panthenol, Simmondia chinensis (Jojoba) Oil, Botanical Keratin, Salvia officinalis (Sage) Oil, Prunus persica (Peach Kernel) Oil, Nardostachys jatamansi (Spikenard) Oil, Melaleuca alternifolia (Tea Tree) Oil, Rosemarinus officinalis (Rosemary) Oil. If you have dandruff I am sure you have tried a thousand shampoos designed to get rid of it. If you are still reading this then it means you still haven't found one that works. Look no further, then, as Maple Holistics has provided a solution. All natural Sage Anti Dandruff shampoo will treat the source of the dandruff with natural ingredients and not with harsh chemicals like you find in so many medicinal shampoos for dandruff. Though I don't have dandruff-well, I don't even have hair!-I have used this shampoo once just to feel it on my scalp as I heard how nice it feels. It doesn't exactly tingle, but it feels invigorated. I think that is the tea tree oil working. This natural shampoo lathers up nicely and has an awesome scent. It's almost an herbal scent that kind of soothes you. But, people really want to know if it works. I have customers in the barbershop ask me all the time for recommendations on how to get rid of dandruff. I only recommend this shampoo and everybody comes back telling me how they finally have a shampoo that gets rid of dandruff and does it without damaging their hair on top of it. Got a beard? Check out these all natural and argan oil based beard products! Nourishes hair follicles, reversing damage and promoting cell growth. If you find your drain in the bath is collecting more and more of your hair lately, then you might be in the market for an anti hair loss shampoo. Before I get into the review of this natural anti hair loss shampoo from Pura D'Or, let me first say that if you have male pattern baldness then this will not work for you. In fact no shampoo will regrow your hair if that is the case. You can regrow your hair by using a shampoo when you are shedding hair but not if you have a bald spot on the back of the top of your head. Ok, with that out of the way, if you are shedding hair because you have a damaged scalp or have been damaging your hair with harsh hair products than you need an anti hair loss shampoo like this one. Specifically this since it works naturally to heal your damaged hair follicles. Some anti hair loss remedies that aren't all natural can leave your hair dry or coarse, or worse and might not even work to regrow your hair. Trust me, I was trying them all until I realized that I had pattern baldness and not just thinning hair. And so many of them left my hair frizzy and brittle. The best natural hair loss shampoos use a DHT blocker which is a hormone responsible for some types of hair loss. The biotin and the essential oils found in the product also help to heal your scalp which promotes hair regrowth. I recommend this product to customers and many have reported back that their hair is indeed thicker and has regrown in the thinning areas. Water, Aloe Barbadensis Leaf Juice, Cetearyl Alcohol, Behentrimonium Chloride, Glycerin, Cetearyl Olivate, Sorbitan Olivate, Phytokeratin, Propanediol, Caprylic Capric Triglyceride, Argan Oil, Shea Butter, Certified Organic Pomegranate, Hibiscus, Green Tea and Sea Buckthorn, Silk Amino Acids, Jojoba Oil, Natural Vanilla Fragrance, Panthenol, Guar Hydroxypropyltrimonium Chloride, Phenoxyethanol, Potassium Sorbate. Hopefully you aren't hungry when you apply this conditioner to your hair, because the vanilla scent will leave you wanting a piece of cake! Don't worry, though, the scent isn't overpowering. This is definitely one of the best conditioners out there, and not just in the natural hair products category. It just works great at strengthening your hair and leaving it feeling soft and natural. If you use gels or pomades or any other hair styling products, then you are probably already using a conditioner after you shampoo your hair to get your hair back on track. If you haven't already tried Silk 18 then you should pick some up ASAP and see the difference. Aqua (purified, deionized water), aloe barbadensis (aloe vera) leaf juice,* cetearyl alcohol, panthenol (vitamin B5), sorbitol (org. humectant), persea americana (avocado) oil,* soy protein, simmondsia chinensis (joboba) oil,* extracts of arnica montana (arnica),* camellia sinensis (white tea),* anthemis nobilis (chamomile)* & calendula officinalis (calendula),* hydrolyzed wheat protein, citric acid, orbygnia speciosa (babassu) oil,* stearamidopropyldimonium chloride, behentrimonium methosulfate, capric caprylic triglycerides, soy lecithin, tocopherols, apis meliferra (honey),* lonicera japonica (Japanese honeysuckle) extract, sodium benzoate, potassium sorbate, essential oils of lavandula angustifolia (lavender),* cedrus atlantica (cedarwood)* & cymbopogon martinii (palmarosa)* Our ingredients and products are never tested on animals. It's not the cheapest conditioner on the market, but these days if you want to have an all natural and organic hair product you have to shell out a few bucks. And you should. John Masters Organics is a superior product that doesn't just make you feel good to use it since it is all natural, but it works extremely well. If you have thick or straight hair that needs to be styled, then I am sure you know how hard that is to achieve without using the right conditioner. Use this one and and your hair will be soft, manageable and above all healthy. Treats frizz, dryness and split-ends so that your hair will regain its softness and shine. Helps prevent protein loss and breakage, while also making hair shinier and more manageable. Cyclopentasiloxane, Dimethiconol, Caprylyl Methicone, Dimethicone Crosspolymer, Fragrance, Organic Argan Oil (Argania Spinosa), Carrot Seed Oil (Daucus Carota Sativa), Organic Coconut Oil (Cocos Nucifera). It's hard to categorize exactly what this product is. It can be a conditioner that you use after you shampoo. It can be a leave in conditioner. According to one reviewer on Amazon, you can even use it as a beard oil. I would say it is best used as a leave in conditioner if you aren't using any styling products in your hair. The argan oil nourishes your hair and leaves it stronger than ever. There is even carrot seed oil in it, which keeps your hair moist. If you use it as a leave in conditioner then it will give your hair an almost wet look like. If you have longer hair, then that would work great for a just out of the shower look without it looking or feeling greasy. Now you need to style your hair but don't want to use a gel that contains any chemicals that do damage to your hair that you've tried so hard to take care of. You really need this Amplixin Natural Styling Gel. Free from damaging sulfates and parabens, and instead infused with caffeine and healthy organic aloe vera, your hair will actually be healthier after using this gel. Yes, you should be putting caffeine into your hair. It strengthens your hair from the follicle up and can also prevent hair loss. If you don't need a high hold and aren't looking for high shine, then you will like using this gel. If your hair is usually flat or weighed down by gels then you should give this a try since it goes on light and does add some volume to your hair. I almost didn't put this on the list, but did since it is not only all natural but contains the ginseng which is unique to a gel. This is not going to work for every hair type and if you need a very high hold gel. It is pretty light so if you want that crunchy type of hold, then you will need to look elsewhere. But, if you do find more and more hairs in your shower drain, then it is worth giving this a try if you need a light hold gel with a wet look. Soft flexible hold to control frizz - with no build up. This Max Green Organic gel works great and not just for an organic one. It isn't super high hold, but if you want a look that can be restyled throughout the day, then you won't be disappointed by this. It is entirely plant derived so definitely vegan approved! The smallish downside is that it isn't great in humid areas if you have really thick hair. Using non synthetic gels was not easy to do a few years ago and many men had damaged hair because of it. As mentioned already, this isn't just non-synthetic, but completely plant based. You don't need to be a vegan to appreciate what that will do for your hair. If you have fine or dry hair then this is an ideal gel for you. Many natural hair gels out there still contain alcohol, which dries out your hair big time. John Masters Organics is a big exception. No alcohol means much more manageable hair when you aren't using the gel. Plus it has aloe vera which keeps your hair moist and soft. Most natural hair products are easy to get behind since they aren't going to ruin your hair. But, sometimes they just don't perform well. John Masters Organics products always do well and don't leave you feeling like you're getting ripped off just because it's organic. It's pricey, but it works well. It isn't super high hold, though so if you want a stiff gel this isn't for you anyway. But, if you have thick hair or longish hair and need something to give it that wet look and don't want it crunchy, then I think you will be happy with this organic gel. Key Ingredients: Aloe Barbadensis Leaf Juice - Saturated with essential vitamins and minerals that help heal scalp, add sheen, luster and shine while fighting frizz and restoring hair back to proper health. Panthenol - Form of Vitamin B5 that penetrates through the cuticle of the hair and acts as a powerful humectant that helps hair maintain moisture, leaving it more pliable, shinier, stronger and thicker. Hydrolyzed Soy Protein - Hair conditioning, strengthening, and repairing. Additional Ingredients: Water/Aqua/Eau, PVP, PEG-40 Hydrogenated Castor Oil, Oleth-10, Ceteareth 25, Petrolatum, Oleth-20, Isopropyl Palmitate, Glycerin, Lanolin, Fragrance/Parfum, Phenoxyethanol, Aloe Barbadensis Leaf Juice, Methylisothiazolinone, Panthenol, Hydrolyzed Soy Protein, Phospholipids, Tocopheryl Acetate, Retinyl Palmitate, Ascorbyl Palmitate. I'm kind of amazed that all hair pastes aren't made of beeswax as this one is since it works incredibly well. Forgetting about the fact that it is all natural for a second, this hair paste will give your hair high hold that lasts all day, it will give your hair a nice textured look and will work on just about any hair type and hairstyle. I don't see any reason to use any other hair paste. It has no alcohol in addition to being all natural so it won't dry out or damage your hair. The one downside, if you can even call it that, is that it is really thick and you have to really rub it into your hands before you apply it. A little goes a long way, though so you don't need to really goop it on. Read the reviews on Amazon and you will see how many rave reviews it gets. And for good reason. I've been using this paste only recently in the barbershop where I work, as I got a free sample of it and wish I had found it years ago. My customers really love it. Water,ceteth-20, glycerin, cetearyl alcohol, glyceral stearate, peg-100 stearate, tribehenin, bis-diglyceryl, polyacyladipate-2, argania-spinosa kernel, oil, coconut oil, vp/va copolymer, dimethicone peg-8, meadowfoamate, fragrance/parfum, dimethicone, phenoxyethanol, caprylyl glycol, ilex paraguariensis leaf extract, ethylhexylglycerin, hexylene, glycol, peg-90m, limonene, linalool, citral, geraniol, citronellol, farnesol, hexyl cinnamal, mat-hsp. Medium hold and high shine, this pomade also leaves your hair soft and healthy. Some pomades can really damage hair and scalp, but this one won't do either. The argan oil will hydrate your hair and repair any damage done to your hair by either blow drying it or from the weather or any other reason. Whether you buy this product or another one, you really need to be using products with argan oil to take care of the health of your hair. The first thing you notice is the texture is not like most petroleum based pomades. It isn't like a vaseline texture, it's more like a cream. So, it goes on really easy. It smells a bit like cake, which wasn't overpowering, but some people might not like the smell. It is a lightweight pomade which won't weigh your hair down if your hair isn't very thick. And having no alcohol means it won't dry out your hair. Ricinus communis (castor oil), glycerin and glyceryl polyacrylate (vegetable-derived gel), butyro-spermum parkii (organic, unrefined shea butter), sorbitol, panthenol, essential oil of vanilla planifolia (bourbon vanilla),* citrus sinensis (blood orange),* citrus reticulata (tangerine)* & citrus paradisi (pink grapefruit),* vitamins A, C & E, phytic acid*Denotes Certified Organic. As with all John Masters organics products, this hair texturizer does not come cheap. And it's small. But it will do wonders for the health of your hair and a little goes a long way. It works like a hair forming cream, so it will help you maintain a style that doesn't need a high hold. But it also gives your hair some texture. If you are going for the messy look, then this is ideal as it will give you the hold and texture you need while also taking care of your hair. It is not water based, so it is a bit thick. Which means it will last all day, but it also means that you won't be running your fingers through your hair to restyle it if you have longer hair. If your hair is longer and you want something strong enough to hold it all day, then you will be happy with this product. It smells really good too, though a bit on the sweet side. Even though it is not water based, it does wash out easily. Thicker Hair Growth with Biotin. Proprietary Vitamin Enriched Hair Loss Formula. No minoxidil or harsh chemicals. Color Safe. What is a hair serum? It sounds like something you would see in an old newspaper ad from the early 1900's, right? A hair serum is usually a silicon based product that coats your hair making it easier to brush if you get tangles. It also protects your hair from over exposure to the sun or pollutants in the air. This serum from Vitagrowth is not silicon based but does coat and protect your hair. But, the vitamins in it will help heal your hair is you have damage caused by heat like a blow dryer or curling iron. The extra added bonus is the caffeine in it which will stimulate some hair regrowth if you have a high level of DHT hormones. So when to use this hair serum: When you have damaged hair that needs repair-When you want to protect your hair from the sun or air pollution-When you want thicker hair or are trying to regrow it. This isn't a product that many men typically use, but if you haven't used it before then you should start. Guys these days simply don't think of the health of their hair, but you should start to. How many of you have used a hair mask? How many of you even know what a hair mask is? Yeah, I thought so. Well, you might not know you need a hair mask but I am telling you that you do. If you don't usually use conditioner and maybe you live in a place with lots of sun. Or, you use a lot of hair products with harsh chemicals. Or, you color your hair or blow dry it frequently than you have damaged hair that badly needs to be repaired. It's time for a hair mask over an after shampoo conditioner. This mask is all natural, organic and plant based. You will notice how healthy and soft your hair feels after just one application. We're living in a time when you don't need to accept that to use a hair product it has to be synthetic. For years even if you wanted to use a natural man's hair product you were relegated to a handful of shampoos and conditioners. But, as soon as you wanted to style your hair, any benefits from that natural shampoo went out the window when you put a petroleum based pomade or a gel with a harsh chemicals. Take advantage of being a guy in these modern times and get yourself some of these natural products to take care of your hair. There's no reason to use damaging hair products any longer. Take care of your hair and it will take care of you! If you've made it this far and are still undecided, I recommend checking out the Mr. Pompadour Peppermint Pomade or alternatively their beeswax paste. I hope this review of the best all natural men's hair products helps you get healthier and stronger hair. If you have any questions about any of these products, send a comment below. Thank you so much! Going to try the beeswax! Much appreciated!